A crisp autumn afternoon with Chuck Feeney (82) on Manhattan’s Upper East Side is a wonderful opportunity to sup with greatness. Yesterday the talk was of family, grandchildren, his beloved Ireland and mutual friends such as Don Keough, former head of Coca Cola and like him, a great philanthropist. He eagerly scanned the copy of Irish Voice I brought him with the tribute to JFK on the cover. Feeney and I have been friends for over 25 years, since he called me up soon after I started Irish America magazine and Irish Voice and demanded to know if the Irish in America were ever going to hang together. I never knew he was rich because he acted poor, meeting me in scrappy diners and leaving me with the check. I put up with it because he was always worth the price of the coffee and the scraped-out onion bagel. Then Forbes magazine published that he was one of the richest men in the world. So was I, that he hadn’t picked up the breakfast checks. He subsequently explained it was because he wasn’t that rich. He had simply given away most of his $7.5 billion dollars, a fact ultimately revealed on the front page of The New York Times. His philosophy was “giving while living,”which he did through his Atlantic Philanthropies. The working class Irish kid from Elizabeth New Jersey surpassed the Rockefellers and Andrew Carnegie when it came to charitable giving. He invented “giving while living,” which is now all the rage. His example directly inspired Bill Gates and Warren Buffett to give it all away too. One of his most important legacies is that he has convinced so many powerful people there are no pockets in a shroud and helping in the here and now is preferable to dribs and drabs over decades. 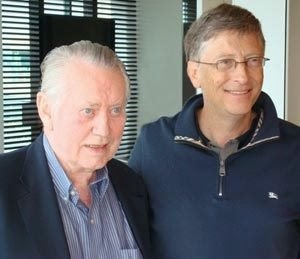 “Chuck has been an inspiration to both of us for many years and was living the Giving Pledge long before we launched this project," Bill and Melinda Gates said recently. “He’s a true innovator and example to anyone who seeks to make the world a better place," Buffett said. But there are no Chuck Feeney buildings or libraries or research centers or medical pavilions. Everything was done anonymously. He jokes that it is very clever because he gets the praise for every anonymous donor these days. Conor O’Clery’s brilliant biography “The Billionaire Who Wasn’t” captures the man so well. Buy it if you want an uplifting read. When it all came out he was runner up for Time’s Man of the Year, the only man in history who got a joint honorary degree from all nine universities in Ireland, all together. There is deserved talk of the Nobel Prize. There is simply no greater Irish American ever in terms of his incredible commitment to the underdog and those in need of an education. Not to mention his role in peace in Northern Ireland, where he was a huge player in the Irish American peace delegation that got President Clinton involved. Back then we spent many hours on planes and cars together going back and forth to Belfast. We never talked money but he finally did spring for dinners. Once he took me on a long walk to a public library in Connecticut so he could pick up magazines for free there. I met him once in the Merrion Hotel in Dublin sampling the free Sunday newspapers.A few weeks later he was up to the same trick in Fitzpatrick’s in Manhattan. These days he has given away about $7.5 billion dollars with another billion or so to go. Irish charities and education institutions got about $1.5 billion of that. Fair to say he transformed Irish education. After making his fortune as a founder of Duty Free Shops he resolved early on that he wanted nothing to do with wealth other than to make it work for others. He gave a billion or so to Cornell because they let him come to their Ivy League college when he was rejected elsewhere. He just seeded a new Silicon Valley type jobs scheme on Roosevelt Island in New York, creating a third level innovative campus with a $300 million grant. He has lavished huge grants in South Africa and Vietnam to name two countries. Then there’s the incredible state-of-the-art hospital he is building in San Francisco that he took me around last spring. Yesterday, I could see he is still powered by a fierce vision. He is the lion in winter, still driven to succeed. When I parted from him and his wonderful wife Helga he asked me to come again and bring bagels the next time. Still cheap, I’m still paying for breakfast it seems.